In the first part of this “How to” section, both PC and Macintosh users can find the instructions on how to activate ImageJ/Fiji plugins within Imaris. The second part, for Mac users, shows which steps to follow in order to connect MATLAB (or MATLAB compiler runtime) to Imaris and thus activate the available Imaris XTensions. ImageJ/Fiji plugins within Imaris, enhance and extend Imaris functionalities by facilitating additional image processing and offering a solution for specific problems. The Imaris Fiji menu allows you to use your favorite Fiji plug-ins and yet continue with your work within Imaris. If you do not have Fiji, first you have to install it. Fiji can be downloaded from the Bitplane Customer Portal. Depending upon your operating system, select the appropriate link and follow the specific download instructions. Now, in the Imaris Fiji menu, you can find a list of plug-ins. However, all plug-ins are deactivated, until the Fiji folder is not specified. The Custom Tools window opens. In the ImageJ/Fiji application field, the executable path must be entered. If you are the PC user, select the Browse button, specify the Fiji folder, and select the .exe file. Click on the OK button and the executable path is displayed the ImageJ/Fiji application field. If you are the Mac user, select the Browse button and Applications are listed. Choose the Fiji application and select the Contents folder. Select MacOS and then fiji-macosx and click the open button. Once the executable path is confirmed, all options are active in the Fiji menu. As soon as you select the first plug-in a new window appears, asking you to install Imaris_Bridge.jar file. Confirm it and the installation starts automatically. The file provides the link between the two applications and enables you to run your Fiji plug-ins in Imaris. The Imaris_Bridge.jar file is placed in a new subfolder, Imaris, within the Fiji application. After installing the Imaris bridge file, all plug-ins are ready to be used. The following section will describe step by step how to set up link between Imaris and either MATLAB compiler runtime or MATLAB and activate available Imaris XTensions. If you are Imaris user without MATLAB, you must install the MATLAB (full version) or MATLAB Compiler Runtime (MCR) on your system. MCR can be downloaded from the Bitplane Customer Portal and enables the execution of MATLAB files on systems without a full MATLAB version. If you are the a PC user, MATLAB and Imaris are automatically linked. 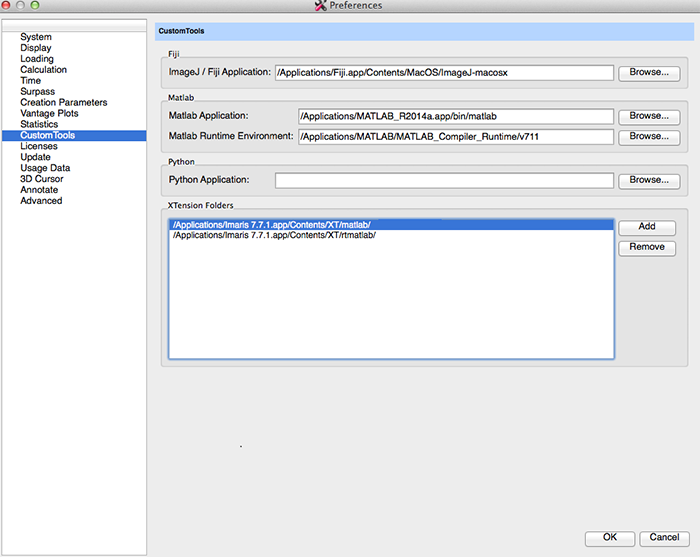 If you are the a Mac user, in order to activate Imaris XTensions the key step is to define a valid MATLAB path. The executable path should be entered under the Custom Tools option. There, depending on your system, you have two options. If you are an Imaris user without a valid MATLAB license, the executable path (for MCR) should be entered in the MATLAB Runtime Enviroment field. Select the Browse button to display the list of applications. Click on MATLAB_Compiler_Runtime, then v711 and select the Choose button. The executable path /Applications/MATLAB/MATLAB_Compiler_Runtime/v711 is displayed the MATLAB Runtime Environment field. If you are an Imaris user with a valid MATLAB license, the executable path should be entered in the MATLAB Application field. Select MATLAB application and then the Bin folder. Click on the MATLAB and select the Open button. The executable path /Applications/MATLAB_R2007b/bin/matlab is displayed in the MATLAB Application field. As soon as the displayed path is confirmed, all XTensions are active and ready to be used.